So I made a lot of progress on assembly over the last few days. I’ve built over half of the models, enough to make about 1500 points without any upgrades. The final goal is to have 2000 points built and painted by November 30th. It’s been a few months since I posted, but I have a pretty good excuse. I was diagnosed with cancer at the beginning of the year, Hodgkin’s Lymphoma specifically and I finished 6 months of chemo in July. The treatment left me without energy and feeling sick all the time making hobby time scarce. I’m officially in remission now and recovering enough to start my hobby back up. To celebrate I have decided to crank out an army in a month. I’m building a Forces of Basilea army for Kings of War. 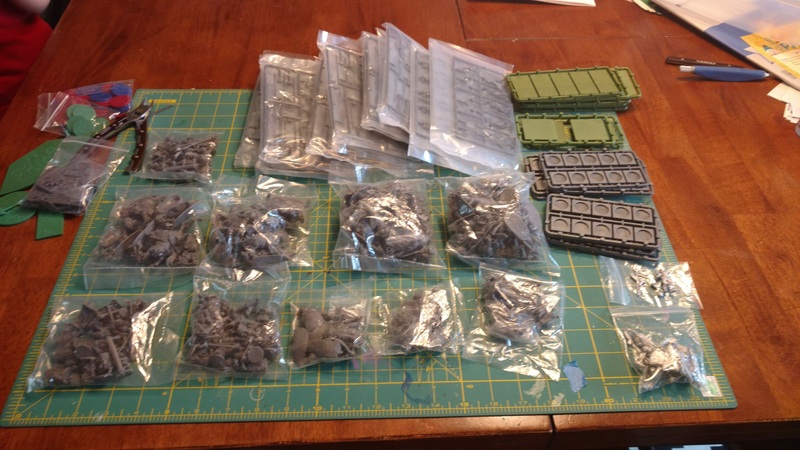 I backed the Kickstarter and recently got the Basilian mega army and rules books. I have around 100 models to build and paint in the next month.